Our All in Development Stories (AiDS) project will end with the end of this month, although we will continue to accept stories until mid-June. Our engaging storytelling theme is still Poverty Relief and Sustainable Development. The keywords of AiDS project for this week are audio storytelling and listening, and short films. To enable people to use cost effective technologies to tell their stories, we are encouraging those who can to submit and share with us stories with audio and short film making; stories related to this year’s theme. Tell and share your story of change for change by communicating the impact you make! The BIG CATS Campaign continues this week with our call of “Making Peace with Animals and Birds”. There are countless examples of cruelty in Africa and elsewhere about beating, killing, exterminating and exploiting animals and birds for illegal trade and other purposes. These examples include throwing stones to endangered birds, killing tigers for their beautiful skins, illegally trading the skins of leopards etc.). All these unkind acts against the nature are the evidence of the lack of peace between humans and animals/birds, especially endangered species. Humans should not only do peace between them, but also between them and the nature. We may not reinvent the wheels, but we can recreate peace with the nature (particularly with fauna and flora). We can make peace with the nature! When we published our Spring Relief programme, we informed all our readers and supporters that we might alter or add to our initial plans new developments to take into account emergency and unpredictable situations. Emergency and unpredictability can happen if there is a war, environmental disaster, sudden appearance of famine or epidemics etc. This is why we have the RILIVES programme (http://cenfacs.org.uk/development-programmes/). At the moment, this adjustment of our plan has been influenced by the current outbreak of Ebola virus in the Democratic Republic of Congo (DRC). As a result of this new wave of Ebola in DRC, we are launching End Ebola in DRC Appeal, which you can find under the Main Developments of this Week’s Contents. You can use the capacity of audio to convey your poverty relief messages and changes. Audio has a proven power and unique quality to convey poverty relief messages. You can inform, empower and connect with others using your audio storytelling skills. Audio storytelling does not demand expensive investment. It is easily accessible to everybody who has at least a smart phone. Audio storytelling (with short digital narratives, podcasting, social media and online streaming) can help create and share the impact of the change you made or have made. Likewise, you can make short films to support your storytelling experiences and create a social impact. For those who can afford, they can use smart phone filming to create engaging content on a tight budget. Also, you can make film on your smart phone with a video content. Shooting interviews with project participants can also help to create experiences that maximize social media contents. If you have audio storytelling and short films related to poverty relief and sustainable development experiences, you can tell and share with us and others. And if you do not mind, we will circulate your stories within the CENFACS Community. This health-enhancing emergency appeal aims at reducing poverty and hardships by helping to end the Ebola virus which has recently re-appeared in some parts of the Democratic republic of Congo (DRC), particularly in the region of Mbandaka and in the capital Kinshasa. Ebola virus, which was discovered in 1976 in DRC, is a very deadly in its nature causing hemorrhagic fever and other health killing effects (such as vomiting, diarrhea etc.). It does cause a severely critical risk to public health as it can lead to a chain of infections. According to the local Congolese health reports, there are already 24 fatalities since the current wave of Ebola outbreak started. This figure can increase if no sufficient action is taken. Whatever the causes of this virus, everything must be done to eradicate this very deadly virus. No longer ago, the world should remember the deadly legacies and effects of this virus on the West African countries of Sierra Leone, Guinea and Liberia; virus which took so many lives there. In the case of DRC, there is already some work going on the grounds to fight Ebola (with the setting up of Ebola security zones). Precautionary measures have been taken like protection of water and hand washing facilities at health centres and health checking of travellers. Experimental vaccinations have been given. But, this may not be sufficient. The insufficiency of this work can be explained by the following factors. Since the mid-1990s, the DRC embarked on the political transition and democratisation processes. These processes have become costly and uncontrollable by local people as they resulted in a prolong war, which almost lasts 24 years and claims millions of lives to now. As a consequence of this prolong war, health and sanitation infrastructures and structures have been destroyed and out of date. This is let alone the degradation of transport, communications and other infrastructures. As we are making this appeal, the DRC is still struggling to come to term with itself in agreeing on the process of presidential election, election due to happen this year. To the above factors, we can add continuous environmental events that this country has experienced over the same period. The lack of adequate infrastructures and of good governance (characterised by a failing State) do not make easier the management of environmental events, especially if they are of gigantic magnitude. Because of the ferocity of this virus and the collapse of both major infrastructures and State in DRC, there is a great and pressing need to make sure this time that the Ebola virus will not be forgotten before it spreads across Africa or struck again in the future anywhere else. Every effort must be deployed to stop it before it becomes an epidemic. Your support is more than needed to save and protect lives from the deadly Ebola virus before this virus overtakes people by speed and time. The history of this kind of disease shows that the spreading speed of Ebola should be stopped before one runs out time, to avoid adverse health and human impact on a large scale, especially on the poor people. There are many ways of helping; however if you decide to join CENFACS’ End Ebola in DRC Appeal, together we can undertake the following actions. You could INFLUENCE people both around and not around you to help those who have been still affected by the deadly virus in the DRC. You could SUPPORT CENFACS to support the people and Africa-based Sister Organisations in need on the grounds where there are outbreak and spread of the Ebola virus. CENFACS, contact us and/or send your support to CENFACS. 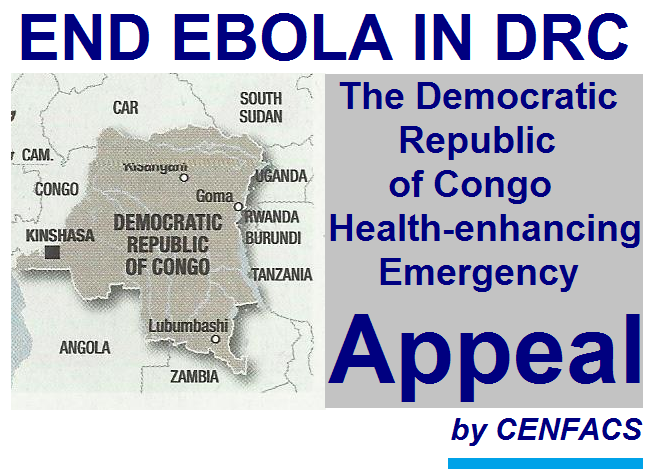 CENFACS hope you will consider this health appeal or circulate this message around you to help the victims of Ebola in DRC.